This Precision Hydraulic Hand Dynamometer from B&L Engineering is the worldwide clinical and research quality replacement for the Jamar® Hydraulic Hand Dynamometer. Measures grip strength from 0-200 lbs (0-90.91 kgms) at five handle positions. Official calibration certificate included with correlation coefficient of .9994 or higher and mean deviation less than 1.5 lbs based on 12 different weights at all five handle positions. 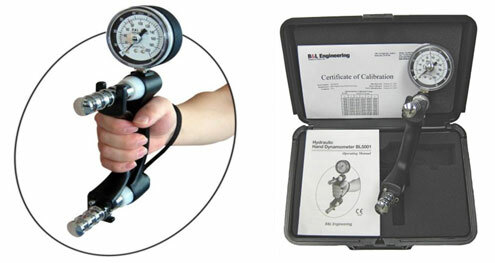 Method of dynamometer calibration defined by Elaine Ewing Fess, MS, OTR, CHT, FAOTA. Includes manual with normative adult and child tables, plus double-walled rigid plastic case with fitted foam to protect the instrument when not in use. Officially CE marked. Two-year warranty! Includes all the necessary instruments for hand and finger evaluation in one convenient carrying case. Includes PG-10, PG-30 or PG-60 Pinch Gauge. Includes 5.5" stainless steel finger goniometer, official certificates of calibration, and manuals with normative adult and child tables. Legally CE marked with notified body numbers. Fitted foam, double-walled carrying case. Two-year warranty. 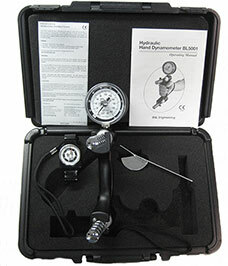 The DHD-1 Digital Hand Dynamometer is a stand-alone device developed to be used just like traditional hydraulic hand dynamometers. With the added capability to save strength testing results in memory, strength testing can be performed and the results reviewed and recorded after all tests are completed. When connected to a PC using the USB cable, the Data Transfer Software (DTS) can transfer the stored test results from the DHD-1 memory into text (.txt) files which can be easily accessed using Notepad or MS-Word for editing and printing. The DHD-1 Digital Hand Dynamometer represents the latest electronic technology applied to the familiar design of hydraulic hand dynamometers. Utilizing electronic load cell transducers instead of hydraulic fluid mechanisms that are prone to leakage; the DHD-1 is extremely durable and designed to last for many years. 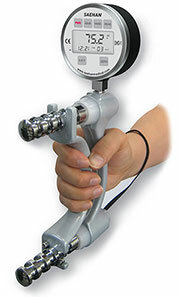 Highly accurate grip strength measurement from 0-200 pounds (lbs.) or from 0-90 kilograms (kg) is digitally displayed on the LCD and up to 20 test results for each hand can be stored in memory. The built-in battery is long lasting and is easily recharged when connected to a PC using the USB cable included with the DHD-1. Includes Data Transfer Software (DTS). The DHD-3 Digital Hand Dynamometer provides the same features as the DHD-1 when used as a stand-alone device, but adds automated Rapid Exchange Grip Testing. 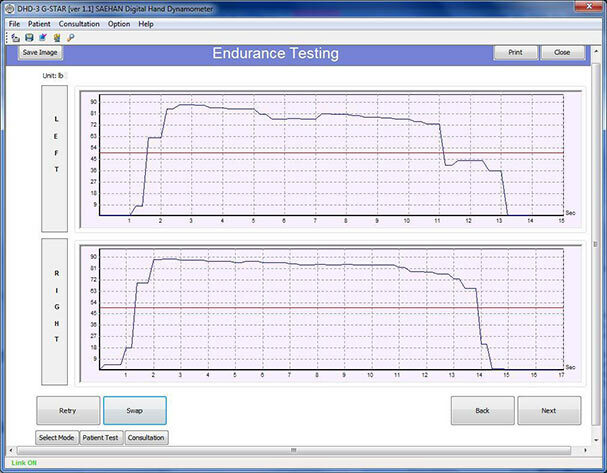 Using Auto Mode, up to 10 test strength tests for each hand as well as the time allowed to switch hands can be configured to automate the testing procedure. USB cable provided is USB A – mini B USB 2.0 cable (480Mbps) and is used to charge the battery and to transmit data. 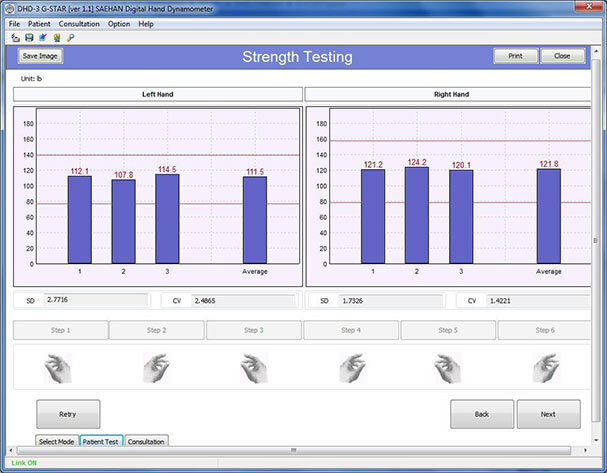 Although the DHD-3 Digital Hand Dynamometer includes many features when used as stand-alone device, the Grip Strength Testing and Research (G-STAR™) software extends the DHD-3 capabilities even further. 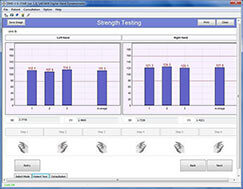 G-STAR is an easy to use, yet powerful software tool which automates grip strength testing and endurance testing in both clinical and research environments. All patient information and their test results are stored in an Access database which includes normative score tables for comparison based on age and gender. Maximum grip strength and grip endurance tests are graphically displayed during testing and can be saved in the database with their associated patient information. In addition, tests saved in the DHD-3 itself when used as a stand-alone device, can be imported into the database when reconnected to the PC using G-STAR software. Default values for search functions, sorting sequence, testing mode, unit of measure and other parameters can be set based on preference and common usage, but can be changed for individual tests as required. 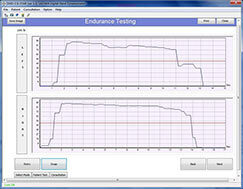 Voice guidance provides assistance during program operation and helps guide the patient during testing. G-STAR also includes utilities for backing up and restoring the database as well as exporting individual test result to text (.txt) files. The G-STAR database can also be directly accessed to export data into Excel for customized analysis and reporting. Notice: The DHD-3 Digital Hand Dynamometer is currently not available for sale in Canada.